Home to port wine, the city of Porto offers plenty to do in a picturesque setting by the Douro river. 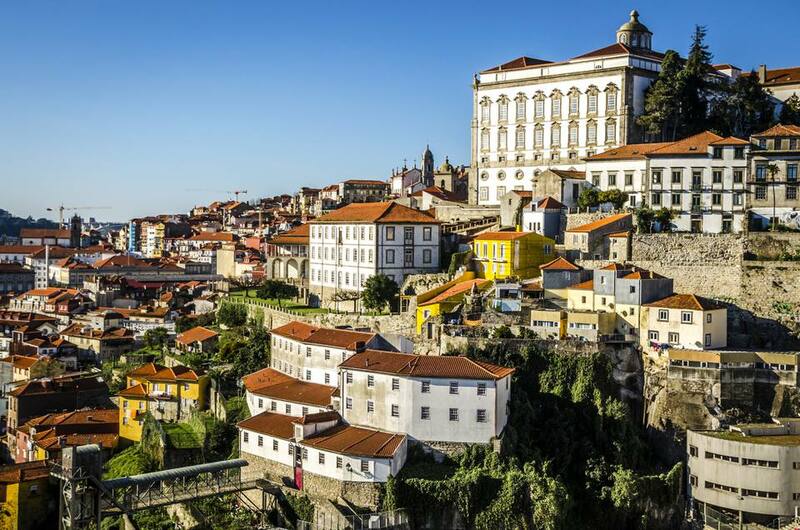 Take a walk along the historic riverfront, while admiring views of Vila Nova de Gaia, Porto's neighbor across the river, dine on some seafood or Porto's gluttonous sandwich, the Francesinha, and see Portugal's famous tiles, azulejos, while admiring all the churches throughout the city. Most of the city's best port producers have a building in Vila Nova de Gaia, just across the river from Porto itself, and many are open for tours or tastings. Each tour typically includes a tasting of a white, ruby, and tawny port with the price of admission (which can be free at some cellars). The more you taste, the more you will recognize your favorite style. Caves Ferreira remains one of the most popular among visitors, as it's the only house that has continued under Portuguese ownership since its founding in 1751. After touring, visit Vinologia, an independent bar that specializes in learning to appreciate port. Now you hopefully know the style of Port that you like, you can compare that type across different producers. This is where you can really zero in on finding your favorite port. Vinologia offers vertical tastings to try different vintages and styles, and also horizontal tastings to help you explore the different producers of a single port style. Want to experience the city like a local? A guided tour, either privately or with a local, is a great way to do just that. If you want to explore Porto at your own pace, try a hop-on, hop-off bus tour that will take you around the city's attractions and historic sites, or try a food and wine tour, where you can taste classic Portuguese dishes like pasteis de nata (an egg custard tart) and bolinho de bacalhau (cod fritters). Probably one of the most iconic structures in Porto, not only does the Ponte Luis I bridge lend itself to the landscape, but it also allows for incredible views of both Porto and Vila Nova de Gaia. You will want to go across the river to Vila Nova de Gaia, whether to visit the Port cellars or just take in stunning views of Porto itself. Porto, its many bridges, and its neighbor, Vila Nova de Gaia, offer up some stunning views. One of the best places to see them? The Ribeirinha, a promenade that takes you along the river Douro and past many cafes and restaurants. Start near the Sao Francisco Church, then head towards the river. You can grab a cheap snack or drink and take in some of the views or continue towards the Ponte Luis I bridge where there are plenty of restaurants. If you feel like sampling some of Portugal's great wines while sitting on the Ribeirinha, check out Avepod. It has a good selection of wines and ports from independent, small winemakers, as well as some delicious nibbles. If you like modern art, then the Serralves Modern Art Museum is a must-see. This museum has rotating exhibitions and amazing gardens for when museum fatigue sets in — don't miss the art deco villa in the garden. The best way to get there is by local bus, and it's easy to combine the trip with a visit to Casa da Música since you can take the same bus to both. Porto's cathedral or Sé do Porto in Portuguese, began construction in the 12th century but was not completed until 1737. As a result, the cathedral has many different types of architectural influences including Gothic, Romanesque, and Baroque. The cathedral is also located right amongst several other sites, including the Pelourinho statue, the Medieval Tower, and an archaeological museum. Plus, you can catch some nice views of Porto nearby. Porto's decadent Francesinha is a sandwich typically filled with various types of meat, covered with cheese, and then drowned in a tomato and beer sauce. Haute cuisine it is not, but it is tasty. One of the best and most popular spots for a delicious Francesinha is Verso em Pedra, not far from the Sé do Porto, along the Douro River. Best to share one, but if you are going solo, you can order a half. A sports pavilion has replaced Porto's original Crystal Palace, but the real attraction here is the grounds surrounding it. As you head towards the river, you will see all the different gardens, designed in the 19th century by German landscaping architect Émile David. From these gardens, you get great views from different angles of the Douro River and Vila Nova de Gaia. Not overrun with tourists, these gardens are a great way to relax, but still get some sightseeing in. They're also nicely shaded, helping you to keep cool during the summer months. Make sure to explore all the grounds, as they wrap around the river. Porto has so many beautiful churches, and almost all are free to enter. Visit a Porto tourism office for a free tourist map, which has the churches marked on it. Many of Porto's sights are within walking distance, and many of the churches are peppered throughout most of the major tourist sites. Even if a church is closed, the exterior can be the best part. Many churches are adorned with azulejos, Portugal's traditional painted ceramic work. Quite often the ones found in churches are blue and white and may depict different scenes. The most famous church is the Gothic Church of São Francisco. While there is an entrance fee, it's worth it. While there is plenty to see and do in Porto, it is an ideal jumping off point for day trips. The scenery of the Douro Valley, the area where Port and other wines are made, is fantastic. You can follow along the Douro river, whether by boat, train, or vehicle and take in the gorgeous terraces where the vineyards are. You'll see why anyone who goes to the valley can't stop praising it. Or head to Braga, which has plenty of churches and a 12th-century cathedral. It is a pleasant and walkable city, where you can fill your day with sites in town. One of the area's biggest attractions is the Bom Jesus do Monte, a sanctuary, which is just outside of the city but is easily reachable by a local bus in Braga.